Low protein dog foods can be controversial. Even though many veterinarians advise against feeding higher protein diets, recent research appears to support their safety — even for senior dogs with minor kidney issues. In another study, older dogs were divided into two groups. One group was fed a low protein diet and the other a high protein diet for the next four years. “High protein pet foods are NOT harmful to a normal animal’s kidneys. As an animal’s body digests and metabolizes protein, nitrogen is released as a by-product. “The excess nitrogen is excreted by the kidneys. A high protein diet produces more nitrogen by-products and the kidneys simply excrete the nitrogen in the urine. So, then, why do so many veterinarians still believe a high protein diet is dangerous to older dogs and kidney health? “The myth that high protein diets are harmful to kidneys probably started because, in the past, patients with kidney disease were commonly placed on low protein (and thus low nitrogen) diets. Or certain types of liver disease, such as hepatic encephalopathy. Due to our respect for a dog’s natural carnivorous bias, we tend to favor dog foods rich in quality meat protein. However, we also recognize there are medical conditions where a high protein diet can have a negative impact on kidney health. 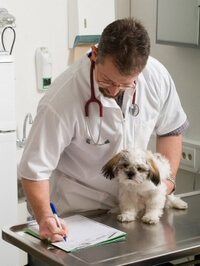 For this reason, if your dog has been diagnosed with active kidney disease, please be sure to consult with your veterinarian before feeding any food to your pet.